Daily Illuminator: Munchkin Valentines Sold Out At Main Warehouse! January 25, 2017: Munchkin Valentines Sold Out At Main Warehouse! We started shipping the new Munchkin Valentines set to distributors on January 9 . . . and already, our primary warehouse is out of stock! We've had good luck with similar Munchkin sets in the past (the Munchkin Halloween Pack was a big hit), and it is fabulous to see that you guys heart Munchkin so very much to make this new pack sell through this fast. We hope Warehouse 23 is loaded up to get us through this and next year's Valentine's Day, but since there are no plans to reprint the set, we wanted to alert all of you that our Georgia warehouse is effectively out of the sets. 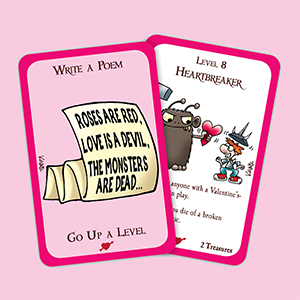 Retailers – Please don't forget our special offer of a Valentines-themed playmat when you order Steve Jackson Games Munchkin goodies with a total MSRP value of $200 or more. Click here for the details, and make sure to get your order in to your favorite distributor before the end of the month. Today is not too soon . . . If you aren't a retailer and would like to get your hands on the playmat, please visit your favorite local game store today and tell them about this promotion. We greatly appreciate your help in spreading the word, and we're certain that your local retailer will find some nice way to reward you for directing them at this chance to bring in more Valentine's Day fun.